Linz Sews: WIPs on the 4th! I feel like I've gotten a lot done this week! Here we go! First off, I redid block 33 - Mini Lone Star. This one is the best of the three, but it still gave me some guff. But I really like it in these fabrics! I really like this block. I did the paper pieced version, and I am glad! I struggled a little getting the subunits together, especially the middle square, but - all in all - I am very happy with it!! Hands down, my favorite block of the series! I love butterflies! And, it came together very well for me! I felt very confident sewing the curves and the Y seams. I just love how it came out! 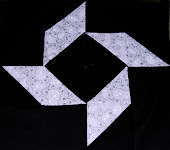 I am going to do this block again and make it into a pillow for my mother in law's birthday! I am so glad that I did this quilt a long! I have really learned so so much! A huge THANK YOU to Leila for hosting this incredible series! And, here they are in all their glory!! Turned out cute! I hope Laura likes it! Coming up this week - piecing the top of my game night quilt, starting a dress, and making 10 utility bags for my husbands climbing gear. Fun stuff! Happy WIP Wednesday!! Be sure to check out all of the awesome WIPs at Freshly Pieced! Your sampler is beautiful! What a lot of work, and it just turned out so pretty! My favorite blocks: value 9 patch, circles, surveyor's compass, flowering snowball, mini lone star, pinwheels, virginia star, and #19 my absolute favorite. An amazing demonstration of your skillz! Glad the last couple of Skill Builder blocks worked out. I had fun drafting them....and still need to make them ;-) Actually have 12 to go. Congrats on getting them finished. Wow! 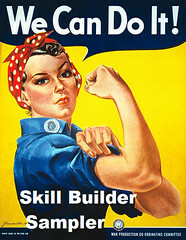 your skill builder blocks look amazing! Will make such an awesome quilt! Your feathered star is a stunner. But I wouldn't expect any less from you--you are a Sewing Goddess, for sure! Wow, incredible work. You are amazing. Way to stick with it!